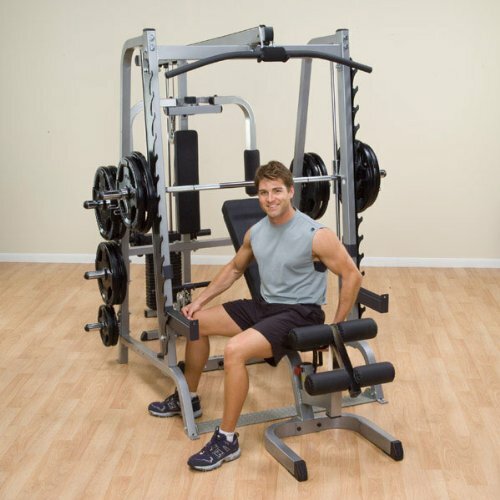 This package includes everything you need for a full Smith Machine workout: Body-Solid Series 7 Smith Machine #GS348Q, 210lb. Selectorized Weight Stack, Commercial FID Bench #GFID71, Lat Attachment #GLA348QS, Pec Dec Attachment #GPA3, Preacher Curl Attachment #GPCA1, Leg Developer Attachment #GLDA3. Combo Offer XMark Fitness 7 ft. Olympic Excercise Bar XM-3817-BLACK with Rubber Coated Tri-grip Olympic Plate weights 70 lb.-Set - includes (2) 10 lb. (2) 25 lb.